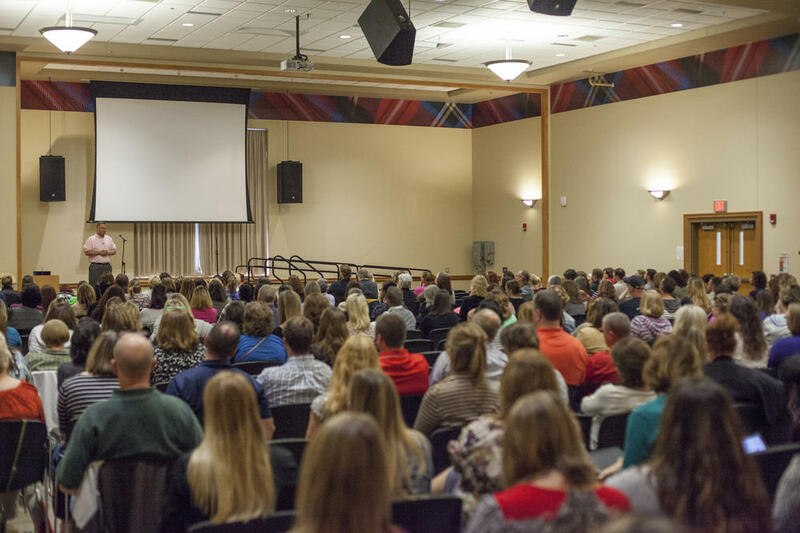 Crawford and Erie County in Northwest Pennsylvania joined together again this fall to host the 3rd Annual Trauma Informed and Resilient Communities Conference at Edinboro University. This entirely free conference was well attended with approximately 318 total participants who sold out the venue in only 4 hours. Our morning plenary promoted the themes of awareness, leadership, and innovation as some of the building blocks of a trauma informed community—a process that can and should have a role for everyone. It began with local experts and “trauma champions” Audrey Smith and Harry Nelson of Parkside Psychological Associates who provided a brief overview of the science of childhood trauma, in particular, the ACEs Study. Our ACEs experts asked the Superintendent of schools at Crawford Central School District, the Executive Director of Crawford County Human Services, the Director of Women Services, Inc., and the Executive Director at Crawford County Drug & Alcohol Executive Commission, Inc. to provide insight into how ACEs awareness informs their practices and how integration between entities makes for a more effective movement towards a resilient community. This session concluded with a morning keynote by the endlessly charismatic Reverend Paul Abernathy from FOCUS Pittsburgh. Reverend Abernathy spoke about his own work as an organizer in the Hill District of Pittsburgh where he works to create “micro communities” of resiliency. These micro communities cooperate with local police, among others, to create a trauma informed community in his neighborhood and effectively offer new perspectives on housing, food security, and community organizing. Eleven 90 minute workshops were offered for service professionals, community members, and students. Topics included therapeutic drumming, secondary trauma, student trauma mitigation through peer supports, hearing voices simulation, QPR (Question, Persuade, Refer) suicide prevention training, a local government faith based initiative, trauma and the criminal justice system, trauma/tension releasing exercises, a panel presentation by young adults transitioning from the child welfare system, trauma and the family, and the role of trauma in mental symptoms. These interactive workshops gave conference attendees an opportunity to dig deeper into an aspect of trauma they are already aware of or offer a new perspective on a field they do not directly work in. We concluded the day with a final powerful keynote from Matthew Sandusky who shared his experience as the adopted son of the infamous former Penn State assistant football coach, Jerry Sandusky, and provided his vision for a future without child sexual abuse. Matt carries out his work as the founder and director of a national non-profit organization called the Peaceful Hearts Foundation. The conference lasted a total of 8 hours and provided a holistic look into the efforts of local educators, social workers, first responders, students, etc. in preventing and recognizing ACEs in their community. Indeed, individuals felt recharged by the passionate and collaborative work happening here in Crawford and Erie County. For more information about ACEs in Crawford County or to get involved with our local trauma informed community committee, Peace 4 Crawford, please email us at leescandinaro@gmail.com. Congratulations, Crawford and Erie County, PA! So exciting to hear about the great interest and turnout for your conference! and thank you for sharing the overview of the day to give other communities ideas to create their own community conference. Very inspiring! Thanks, Lee! What a terrific conference. When did it happen?